Britain's Scott Quigg stopped Spain's Kiko Martinez in the second round in Manchester to defend his WBA super-bantamweight title for the sixth time. Quigg, 26, struggled in the first round but floored the former world champion in the second with a fierce uppercut and followed up with a further barrage until the referee intervened. "I was expecting 12 tortuous rounds," he told BBC Radio 5 live sports extra. "I was welling up in the ring because hopefully now I'll get some credit. It is everything I've wanted as a kid." The Bury boxer said the fight had gone according to his game plan. 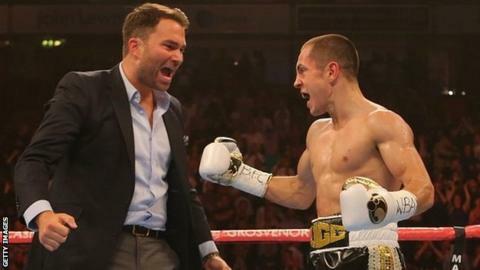 "The first round was how we knew it would be," said Quigg. "He was very nervous, so was sharp and on edge, and I had to see what he was doing. "Scott Quigg has really arrived now. He had his acid test and came through with flying colours. He's going to want the big fights now such as the Carl Frampton fight. That was a destruction in the second round." Quigg's main rival Carl Frampton defended his IBF title against Mexico's Alejandro Gonzalez Jr in El Paso, Texas at the same time as the fight in Manchester. Northern Ireland's Frampton took the title from 29-year-old Martinez in Belfast last September. Quigg's promoter Eddie Hearn said: "His stock's going to keep on rising and obviously the Carl Frampton fight's the one everyone wants." Meanwhile, in Germany, London 2012 bronze medallist Anthony Ogogo made his return to the ring after a 12 month lay-off with an Achilles injury. The 26-year-old laboured to a points win over Ukraine's Ruslan Schelev after six rounds in a middleweight contest. However, he posted on Twitter that he dislocated his shoulder in the second round and faces another lengthy injury break.